Humans have used the greater part of the biosphere and burnt a lot of fossil fuel. It is feared that carbondioxide could cause run-away warming, as could have happened to Earth's "sister planet" Venus. Indeed a scary possibility, hence the establishment of the IPCC as independent adviser of the situation. Unfortunately, their advice has not been independent but highly political. In this chapter we'll dissect the science behind the fears. The IPCC is a suspect organisation, exposed by the Climategate scandal, but apart from this, its reports and recommendations were not based on scientific proof. This chapter explores its extraordinary claims. A critical look at the IPCC's fourth assessment report (AR4) shows that it is a house of cards stacked on flimsy evidence. The hockey stick graphs of both carbon dioxide and temperature have enabled the IPCC to validate its computer models, and to make scary predictions. But these graphs were made fraudulently. The entire weight of the IPCC rests on its global circulation computer models, even though these have severe limitations and only project what is fed into them. For extraordinary claims, extraordinary proof is required but where is it? All IPCC claims are proved wrong. A number of observations seem to support the AGW hypothesis or create other conflict, and they are important enough to be reviewed. Some strange pronunciations made by the IPCC. IPCC assessment reports All IPCC assessment reports like 2001 TAR, 2007 AR4. http://assassinationscience.com/climategate/ extensive Climategate analysis by John P. Costella. Important to understand the magnitude of malfeasance. http://folk.uio.no/tomvs/esef/ESEF3VO2.htm Carbon cycle modeling ...Tom V Segalstad (2003). A lot of inside information and critique. http://cdiac.ornl.gov/by_new/bysubjec.html CDIAC repository of raw data relating to global warming. Some not free. Humans have used over 60% of the productive land, excluding ice, desert and rock, and used to extreme its resources like soil and water. It is logical then to expect that this will have an effect on climate. The use of fossil fuels has spurred the development of societies, with untold many benefits, but now it is feared that it could change the world in a catastrophic way. Already before 1950, some scientists saw that our use of the atmosphere, particularly through the release of carbondioxide, could also cause climatic changes. 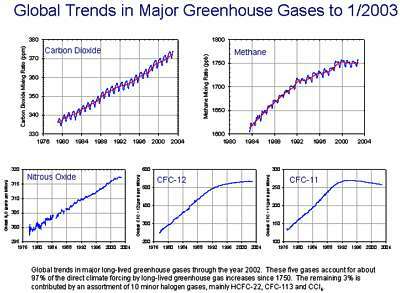 CO2 is a very potent 'greenhouse' gas (GHG), as is methane. Both could inhibit outgoing infrared radiation and thus affect the Earth's cooling. A warmer Earth could lead to the melting of ice caps, the rising of oceans and a whole lot of other disasters. In the worst case, it could create 'run-away global warming'. The decisive moment came with the Earth Summit in Rio de Janeiro (1972) where influential activist Maurice Strong played an important role. The IPCC was established in 1988 by the World Meteorological Organization (WMO) and the United Nations Environment Programme (UNEP), two organisations of the United Nations. In 1990 it produced its First Assessment Report (FAR). Maurice Strong: "We may get to the point where the only way of saving the world will be for industrial civilization to collapse"
Richard Benedick US deputy assistant secretary of state: "A global warming treaty must be implemented even if there is no scientific evidence to back the greenhouse effect"
Timothy Wirth, US undersecretary of state: "We have got to ride the global warming issue. Even if the theory of global warming is wrong, we will be doing the right thing in terms of economic policy." From here on it became a political battlefield, because it was clear that reducing emissions was not going to be easy. 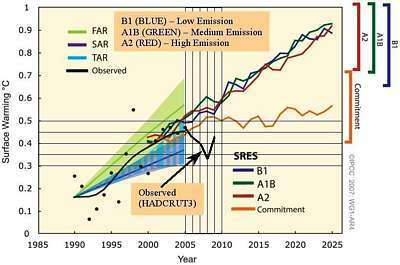 The FAR was followed up by the SAR (1995), the TAR (2001) and finally AR4 (2007) (AR5 is expected in 2014). Finally some hard-hitting commitments were to be agreed upon in the Copenhagen Summit (Dec 2009). But three things happened just before: 1. a financial collapse had governments in its grip. 2. In September the Climategate  erupted over leaked e-mails from IPCC leading authors, condemning the scientific process and the IPCC. 3. After almost a decade of climatic cooling, the Copenhagen Summit experienced extreme cold weather after temperatures began to dip since 1998. The Public and Politicians suddenly woke up to the biggest scientific scandal of all times, which will change the IPCC and climate science forever. Suddenly emissions reduction and emissions trading were no longer 'on the agenda', and at the time of writing (2010), all IPCC recommendations are on hold indefinitely. Finally some common sense is percolating through. In order to investigate this further, we'll first explore the IPCC's Fourth Assessment Report, then the hockey sticks of temperature and carbondioxide and also the computer models on which it is based. Then we'll investigate each of the extraordinary claims, only to discover that they are not backed by extraordinary proof. also because mitigation requires extraordinary effort and a debt on future generations. this is due to Man's burning of fossil fuel and other activities. ocean levels are rising, due to fossil fuel burning. Finally we'll investigate some conflicting findings. the IPCC and its scientific process are seriously in limbo. forget the IPCC with its artificial 'projections' and pay attention to real observations and read the Alternative Summary for Policy Makers (SPM)  which raises many red flags. "Science has made enormous progress toward understanding climate change. As a result, there is a strong, credible body of evidence, based on multiple lines of research, documenting that Earth is warming"
Thermometer measurements show that Earth’s average surface temperature has risen substantially over the past century, and especially over the last three decades. These data are corroborated by a variety of independent observations showing warming in other parts of the Earth system, including the oceans, the lower atmosphere, and ice-covered regions. Most of the recent warming can be attributed to fossil fuel burning and other human activities that release carbon dioxide and other heat- trapping greenhouse gases into the atmosphere. Human activities have also resulted in an increase in small particles in the atmosphere, which on average tend to have a cooling effect, but this cooling is not strong enough to offset the warming associated with greenhouse gas increases. Changes in solar radiation and volcanic activity can also influence climate, but observations show that they cannot explain the recent warming trend. Natural climate variability leads to year-to-year and decade-to-decade fluctuations in temperature and other climate variables as well as significant regional differences. www.climatebasics.com debunking the whole gamut of AGW. Alternative Summary for Policy Makers by Joseph D'Aleo and Anthony Watts, January 2010. A damning critique of the temperature datasets held by NCDC and NASA GISS, CRU, on which the IPCC bases its findings. The alternative SPM raises many red flags. Read now. 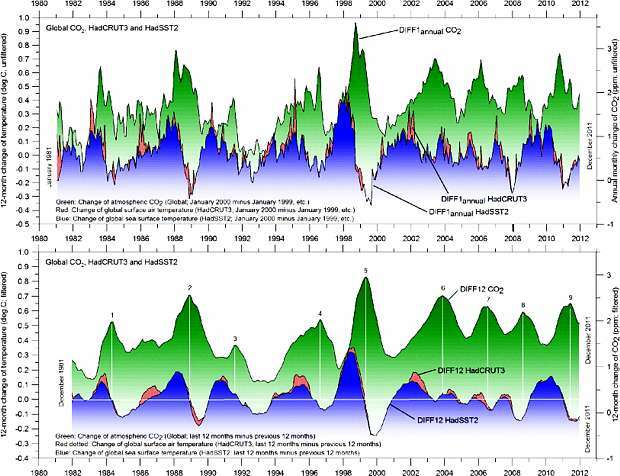 http://scienceandpublicpolicy.org/images/stories/papers/originals/surface_temp.pdf - Joseph D’Aleo and Anthony Watts (2010): Surface temperature records: policy-driven deception? (200 pages) "..so much fiddling and dishonesty have been going on that it is impossible to say whether warming has occurred at all". Surface temperature recordings are in a terrible mess. Important read. Paulo N. Correa, Alexandra N. Correa (2008): Global warming: an official pseudo-science. http://www.aetherometry.com/publications/direct/Global_Warming.pdf. A scathing hard-hitting scientific critique by insiders, long before Climategate. An important eye-opener and look behind the scenes, but read with care. The IPCC fourth assessment report, like its three predecessors, is a massive volume of nearly 1000 pages, put together by a large number of contributors from many nations. It is the result of many years of study in trying to understand climate changes such that binding agreements for mitigation can be entered into, costing some trillions of dollars. In this chapter we'll have a critical look at this authoritative report. Summary for policy makers: relies on all other information. It focuses on 'projections' based on 'scenarios' of fossil fuel use. Work group 1 (WG1): "The Physical Science Basis" . It focuses on inputs and outputs of computer climate models. This is the supposedly scientific basis for everything else in AR4. Work group 2 (WG2): "Impacts, Adaptation and Vulnerability". It is based on the findings of WG1, applied to the world we live in: climate change, rising seas, problematic weather, and much more. Work group 3 (WG3): "Mitigation of Climate Change". It is based on the findings of WG1 and WG2. Synthesis Report: is based on all of the above. The report almost satisfies the definition of circular logic where A explains B, B explains C; C explains A. In that respect, 980 pages out of 1000 are irrelevant, all depending on pages 129-234 of WG1, which goes awfully wrong right from the first page after the introduction: "How do human activities contribute to climate change and how do they compare with natural influences?". 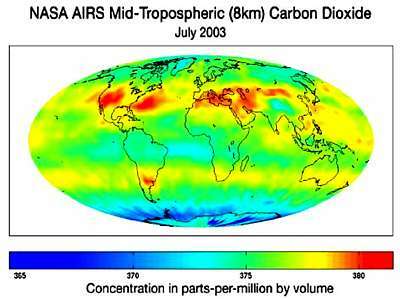 It gives high credence to the influences of carbondioxide (increasing), methane (levelling off, irrelevant), nitrous oxide (levelling, irrelevant), halocarbon gases (now controlled, irrelevant), ozone (destroyed by halocarbons), aerosols (more of) and "Water vapour is the most abundant and important greenhouse gas in the atmosphere. However, human activities have only a small direct influence on the amount of atmospheric water vapour". "Natural forcings arise due to solar changes and explosive volcanic eruptions". And with these sentences, it dismisses major atmospheric changes not due to humans, to the dustbin. Clunk ..
Miskolczi may be the only one who has it right, because not only the radiation balance applies but also the thermal energy balance, such that all greenhouse gases work together. If one increases, others decrease and the universal greenhouse gas is water vapour, which rains out if some other greenhouse gas takes its place. The total energy balance (not radiative balance) remains the same. Earth's atmosphere is maintained at a nearly saturated greenhouse effect, such that outward radiation has no effect but clouds have . Thus climate sensitivity to CO2 is negligible, if CO2 had any effect at all. The same for any other greenhouse gas including water vapour. Note that Miskolczi neglects heat conduction and convection. Previous historical estimates for climate sensitivity: 5.5= Arrhenius 1896; 3.5= Plass 1956; 3.2= Phillips 1965; 3.0= Charney 1972; 1.2 =Hansen-Houghton 2001. - A downward trend also seen in successive IPCC reports. It is believed that due to warming, the extra water vapour in the atmosphere may worsen the CO2 effect. Hence the invention of a feedback factor. To make it look scientific, it is defined as extra warming factor = 1 / (1 - ƒ) where ƒ = 0.5 to 0.8 in IPCC models leading to a two- to five-fold magnification of the effect of CO2. In case ƒ = 1, the extra warming becomes infinite (division by zero) and if ƒ=0, the extra warming factor becomes 1(no extra effect). It must be noted that this formula does not have any basis in the science of feedback systems (cybernetics). Nor does it have any basis in our understanding of climate. It is a fudge factor. Temperature increase = 0.75 x heat increase. In simple language, the fudge factor is nothing but a logarithmic curve (ln) for the increase in CO2; and the only question is what would happen if the amount of CO2 in the atmosphere is doubled (C/C0 = 2). So the natural log of 2 is used. Then to get the desired end result, the constant 5.35 is multiplied times it. But this was published in 1988, when the desired result was 3°C. Later, the 3°C became preposterous, and the desired temperature change was reduced to 1.2°C. This would require the 5.35 to be reduced to 2.31. Then recently, the temperature increase was said to be 1°C, which would require the constant to be reduced to 1.92. But now, it is reduced by 15% to supposedly account for overlap of the absorption curve by water vapor. So the most recent rendition of the constant would be 2.26 minus 15% for water vapor. This number never shows up in print, because it has no origins in physics, its just a fluid contrivance for getting to the desired end point. Determining where this equation came from is no easy task. Steve McIntyre tried to trace down the citations for it in the IPCC documents and failed. All of the references led to no real explanation! all predictions are based on computer models, and their limitations are not acknowledged (see computer models below). the models are circulation models (fluid dynamics) and not atmospheric models. failed model projections are not acknowledged: the 1980-1990 models predicted 20th century warming 1.6-3.7 ºC; Actual 0.6ºC and now cooling by even more. Much of the warming is still due to the urban heat island effect and corrupted data as well. 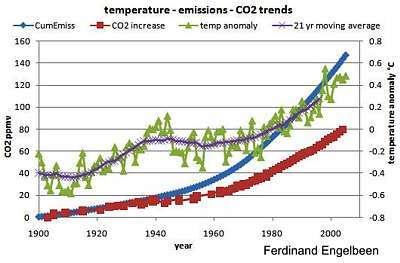 the whole edifice rests on a hockey stick curve for CO2 and one for temperature, both fraudulently obtained (see hockey sticks below). the CO2 hockey stick rests on a single ice core, ignoring centuries of chemical CO2 measurements. only anthropogenic causes are considered (fuel gases, gases from living, gases from industry, land use), because "no other explanations could be found", which is unscientific. a positive feedback fudge factor is invented to make CO2 seem worse than factual. none of the radiative forcings have been proved. They are just assumptions. the external effects from outside the solar system are ignored, even though these correlate well with measured facts. the consequences of variations in solar radiation and solar wind have been pooh-poohed. they ignored warming seen on other planets of our solar system and the moon. the effect of water vapour has been down-played, "because humans do not alter it". the huge cost from the 'commitment' option is underestimated. the beneficial effect of mitigation is overestimated. Computer model projections show that full implementation of the Kyoto Protocol may result in temperature reduction of an undetectable 0.06 Celsius by 2050 at a cost of about US$1,000,000,000,000 (one trillion). The 'full commitment' option would cost that much every year. no contingency is made for global cooling, its effects and its mitigation, whereas cooling is much worse for society and environment than warming, and is equally likely. no mention is made of the beneficial effects of CO2 and warming: better plant growth, more food, more area for agriculture, less water required, less degradation of soils, less erosion. The IPCC report is grossly unbalanced. In summary, the IPCC has spread an unjustifiable scare for 'Catastrophic Anthropogenic Global Warming (CAGW)'. Its Assessment Report is a fragile house of cards resting on the flimsiest of evidence, backed by fraudulent data and procedures. It has created a warming industry employing millions of people (scientists, politicians, green activists, economists, engineers, financiers, speculators and profiteers, and their support teams) for a non-existent threat, while ignoring a real possibility of global cooling and the benefits from CO2 and warmth. It has stolen from the poor an unimaginable sum of money that could have been spent more wisely. And they have spread a traumatic fear of the future among today's children. The massive US government climate change research gravy train alone totaled some $9 billion in grants during 2009. And the United Nations hands out over 1 trillion dollars for this. the IPCC is an institution where politics comes first, science second and truth last. the IPCC reports are extremely biased and unbalanced. Benefit from warmth and CO2 are not mentioned. evidence for their claims is flimsy or non-existent. their computer models are based on assumptions. the science is far from settled. There are too many scientific conflicts. the magnitude of the climate is severely underestimated, thinking that mitigation is possible. the world is ill prepared for cooling. The diagram above from Kellogg (1982) and Smith (1985) shows some of the complexity of the climate system, without even mentioning the influences of sunspots and cosmic radiation. Neither does it show the influences of human activity. Practically none of this complexity has been programmed into the IPCC circulation models, and yet the world has now for over 20 years paid paramount importance to their predictions. Fraser Institute's Independent Summary For Policy Makers. http://www.fraserinstitute.org/Commerce.Web/product_files/Independent%20Summary5.pdf. Roy Clark's comments (2011): Radiative forcing is a purely fictional concept that was introduced in its current form by Manabe and Wetherald in 1967. Saved here. Important! In its First Assessment Report, the IPCC showed the bottom graph as the historical record for the past thousand years (in Europe), but in its Third Assessment Report (TAR 2001), the above Hockey Stick appeared, first published by Mann, Bradley and Hughes in 1998 (MBH98). It showed more dramatic warming in the last decade, hid the decline of the Little Ice Age and other periods of cold, and the Medieval Warm Period that saw Europe flourish. It claimed the 1990s as the warmest period in past 2 millennia. For a more detailed graph of temperature changes in the past two millennia, and what happened, click globaltemp4000yr.gif. In one diagram several hockey sticks are shown, as they changed somewhat over time. The black curve is that published by Mann et al. 1998, with the wrong statistical technique, leaving inconvenient data out (Briffa's divergence), mixing tree ring data with instrumental data (the stick was treemometer data, while the blade was from manipulated thermometer data) and so on . The blue curve is McKitrick & McIntyre's correction for the same data, restoring the existence of the Medieval Warm Period. Finally the green hockey stick appeared in the IPCC AR4, spliced onto part of the instrumental record, leaving an inconvenient bit off. The green dashed curve represents Briffa's 'divergence' shown in many tree ring records, but conveniently left out by Mann et al. Notice the many manipulations here, some cheating and also the vastly extended vertical scale. The IPCC argues that there was little natural climate change over the last 1000 years, so that the temperature change of recent times (red curve) is unusual and likely caused by human activities. A senior IPCC researcher said in an email "We have to get rid of the Medieval Warm Period" . Christopher Monckton says "They did this by giving one technique, measurement of tree-rings from bristlecone pines, 390 times more weighting than other techniques but didn't disclose this. Tree-rings are wider in warmer years, but pine tree rings are also wider when there's more carbon dioxide in the air: it's plant food. This carbon dioxide fertilization distorts the calculations. They said they had included 24 data sets going back to 1400. Without saying so, they left out the set showing the medieval warm period, tucking it into a folder marked "Censored Data". They used a computer model to draw the graph from the data, but two Canadians [Ross McKitrick and Stephen McIntyre] later found that the model almost always drew hockey-sticks even if they fed in random, electronic "red noise" because it used a faulty algorithm." The MBH 1998 report was never properly peer reviewed before the IPCC used it in their publications." McKitrick and McIntyre say in their paper "the dataset used to make this construction contained collation errors, unjustified truncation or extrapolation of source data, obsolete data, incorrect principal component calculations, geographical mislocations and other serious defects. These errors and defects substantially affect the temperature index. The major finding is that the values in the early 15th century exceed any values in the 20th century. The particular “hockey stick” shape derived in the MBH98 proxy construction – a temperature index that decreases slightly between the early 15th century and early 20th century and then increases dramatically up to 1980 — is primarily an artefact of poor data handling, obsolete data and incorrect calculation of principal components." McIntyre and Ross McKitrick, showed that MBH98 was a sloppy, poorly documented paper riddled with simple mistakes, unjustified assumptions, collation errors and incorrect methodology. Data, for instance reported to be from near Boston, Massachusetts actually came from Paris. Central England Temperature data was truncated eliminating its coldest period. Principal component analysis (PCA) had been done incorrectly. Drs Mann, Bradley and Hughes published a terse reply on the Internet rejecting out of hand the criticisms of MM03 and not admitting to a single error. Inappropriate Bristlecone/Foxtail “strip-bark” proxies were used. now a temperature hockey stick was needed, and MBH98 obliged fraudulently. Our use of fossil fuels has sky-rocketed since the beginning of the industrial revolution which began in 1850 with the steam engine. There has been a pause during the Great Depression and World War 2 after which it really took off. The graphs show how coal has been replaced by oil, and later oil by natural gas. Their combined carbondioxide has entered the atmosphere but also left it to a surprising degree. Note that the CO2 from cement production is rather small, but cement's absorption of CO2 over time was omitted. Now extend the graph on its left to the year 1400, and the black curve very much resembles a hockey stick. We know anthropogenic CO2 emissions quite precisely because the amounts of coal, oil and gas exploited have been accounted for (blue curve). But when it comes to CO2 concentrations in air, we only have the instrumental Keeling curve from Mauna Loa, since 1960 (the fat right-hand part of the red curve). Its leftmost part was derived from air bubbles in ice cores, and is suspect. However, the two parts together make CO2 in air look as if it was produced by anthropogenic CO2. The relationship between CO2 and temperature, however, is not so clear, particularly when the downward trend after 2000 is considered (truncated and not shown). Note how this temperature curve does not look like the IPCC hockey stick. There is something wrong with the above graph, which can't be seen because it has been cut off. On the left it doesn't show that temperature comes out of a deep dip, and on the right it won't show recent sharp cooling since 1998. AR4 page 137 states: "A wide range of direct and indirect measurements confirm that the atmosphere mixing ratio of CO2 has increased globally by about 100ppm (36%) over the last 250 years from a range of 275 to 285 ppm in the pre-industrial era (AD 1000-1750) to 379ppm in 2005". Where are these measurements apart from the Keeling curve? Surely not all from ice cores? the temperature hockey stick is entirely fraudulent. other CO2 measurements have been ignored or rejected. Holland, David (2007): Bias and concealment in the IPCC process: the 'Hockey-stick' affair and its implications. http://meteo.lcd.lu/globalwarming/Holland/Bias_and_Concealment.pdf - an important read, also for future generations. http://www.greenworldtrust.org.uk/Science/Scientific/MLO-emissions.htmHidden surprises in the CO2 figures. A critical analysis of the Keeling curve and what it means. The computer models used by the IPCC are mostly Global Circulation Models (GCMs) based on the mathematics of fluid dynamics with added complexity. So their main strength is in how temperature is spread around the globe by the circulation of air, and more recently of ocean currents as well. But they are severely deficient in dealing with the complexities of Earth's climate, as this chapter will demonstrate. Computer models have made great progress since the very first ones running on IBM mainframe computers (1970s). Since then, computer crunching power has increased dramatically and so has the complexity of climate models . The IPCC relies on about two dozen slightly different GCMs. 1970s Very basic simulation of a flat Earth with solar irradiation and an atmosphere with CO2 and water circulation as rain. 1980s The land surface is now added and ice areas and clouds. First Assessment Report 1990 A shallow 'swamp' ocean is added with properties differing from those of the land. 500km squares. 2nd Assessment Report 1995 Volcanic activity, sulfates from industry, melting ice and flat ocean circulation are added. 250km squares. 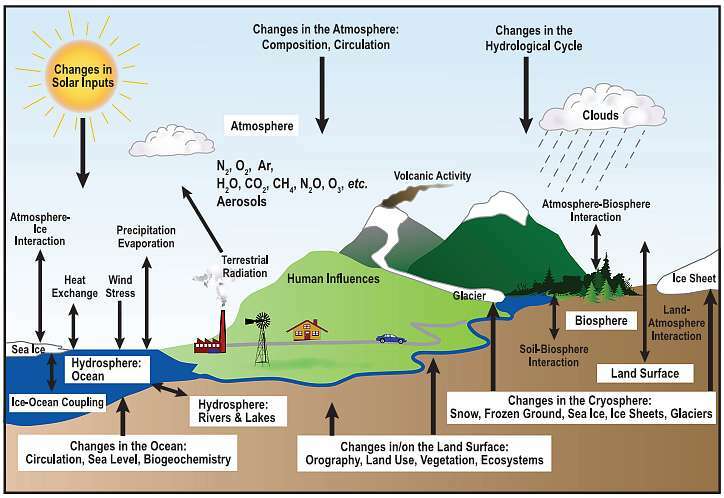 3rd Assessment Report 2001 Aerosols are added and the carbon cycle, as well as rivers which complete the water cycle. Also the ocean now has an overturning circulation. 180km squares. 4th Assessment Report 2007 Some atmospheric chemistry is added and interactive vegetation simulating land use. 110km squares. IPCC AR4 proudly presents this diagram showing all the factors taken into account in their GCMs but most of these factors are entered as 'forcings' which are fixed parameters equivalent to energy inputs, in other words, fudge factors. an incomplete understanding of the climate system: there are simply too many unknowns and conceptual errors. Knowledge has not stood still. an imperfect ability to transform our knowledge into accurate mathematical equations: most effects are parameterised and 'tweaked' to reach the desired effects. Most mathematical equations are simplified or linear. the limited power of computers: even with 100km grids, present-day supercomputers are not powerful enough. the models' inability to reproduce important atmospheric phenomena: the actual physics is left out which leaves the models open to runaway fantasy, not limited by physical constraints. inaccurate representations of the complex natural interconnections: present models cannot connect population density to urban heat island effect; land use change to a change in the hydrological cycle; and so on. They are not science because computer models, spreadsheets and computer programs cannot be proved to be right (verified). They cannot be falsified either, an important deviation from true science. GCMers circumvent this problem by letting their models predict the past, while tweaking their many assumptions, and then believing what they predict for the future must be true. This is no proof and tweaking is not science either. GCMs just follow the GIGO law of computing: Garbage In = Garbage Out. If only a single assumption is wrong or a single factor has been left out, the GCM and its prediction is simply WRONG, and the chance of a GCM being RIGHT is infinitesimally small and wouldn't be recognised. Imagine our planet the size of a billiard ball. Then the thickness of our biosphere from the deepest ocean trench to the highest mountain and above that, amounts to a smear of no more than a human hair in thickness. Within this thin smear, everything happens from deep ocean circulation to surface currents to surface weather to jet streams to troposphere and ozone holes. Computer models do not like the absurd difference between vertical and horizontal dimensions (1000 times). So they work with all kinds of assumptions on how one layer affects the next. They are not EXACT. The computer power to do better has not yet arrived. Present grid points are about 110km squares. Compare this to a 10km troposphere and the models are still 30-50 times too coarse. GCMs treat the planet as a dead planet, but we know that the planet reacts as if it were a living organism. We owe this to independent scientist James Lovelock who concluded that Earth's atmosphere was so unlike its sister planet ( Mars) because life had changed it. He also discovered how Planet Earth as a living organism (GAIA), regulates its temperature. GCMs leave out major drivers or 'connections'. The driver of global warming is thought to be: more people -> more fossil fuel burning -> more greenhouse gases -> global warming. But the GCMs concern themselves only with the last step. However, the planet reacts: more CO2 -> more plant growth, thereby absorbing a very large part of human-made CO2. Better still: more CO2 -> more plankton -> more dimethylsulfide (DMS) -> more clouds -> global cooling. Leaving this feedback effect out, will simply give wrong results. One would expect that the global cooling gas DMS has been studied extensively and monitored accurately since it was first discovered, but not enough of this has happened, even though NOAA is constructing a database of DMS concentrations for future use by GCMs. Changes in the water cycle: One of the largest drivers of climate change has been ignored completely by GCMs: more people -> less forest -> less water circulation -> less heat transfer -> major climate change. It results in the centres of continents drying, deserts expanding, continental glaciers shrinking, winds changing their paths, ice caps shrinking, and ocean currents changing. This climate change began even before fossil fuel use. What you need to understand is that heat transfer around the globe is done mainly by water evaporating and condensating, and that all rain and snow comes from the sea. If such a large driver is left out from GCMs, how reliable can they be? What is the whole climate change debate worth without it? Changes in wind strength: We owe it to the late Joseph Fletcher (Chapter7,must-read), who asked "what is NORMAL climate change?" and then discovered that wind speed was climate's most important driver, but this is not included in circulation models. Climate models are not predicting future climate. They are predicting the current expectations of climate modelers about future climate. they do not simulate atmospheric physics. Instead 'guestimated' parameters are set. They do not simulate water vapour and cloud formation behaviour with altitude; neither vertical heat transport. they cannot handle a 'fluid' with variable density, as air is. clouds cannot be parameterised correctly: clouds arise in response to local conditions and little is known about it. Same for winds. forecasts are not separated from politics: they drive politics. the various models are not independent: they are all alike, driven by the same beliefs. "The forecasts in the Report were not the outcome of scientific procedures. In effect, they were the opinions of scientists transformed by mathematics and obscured by complex writing. Research on forecasting has shown that experts’ predictions are not useful in situations involving uncertainty and complexity. We have been unable to identify any scientific forecasts of global warming. Claims that the Earth will get warmer have no more credence than saying that it will get colder." Prof Freeman Dyson: "the models used to justify global warming alarmism are full of fudge factors. They do a very poor job of describing the clouds, the dust, the chemistry, and the biology of fields and farms and forests. They do not begin to describe the real world that we live in"
Dr. Zbigniew Jaworowski: "the U.N. based its global-warming hypothesis on arbitrary assumptions and these assumptions, it is now clear, are false." Dr. Richard Lindzen: the IPCC is "trumpeting catastrophes that couldn’t happen even if the models were right." Prof. Hendrik Tennekes: "there exists no sound theoretical framework for climate predictability studies used for global warming forecasts". Prof Robert E Stevenson: "The science of climate has been buried alive by an avalanche of ideology-based computer models"
1. Their upper tropospheric water vapor feedback loop is grossly wrong. They assume that increases in atmospheric CO2 will cause large upper-tropospheric water vapor increases which are very unrealistic. Most of their model warming follows from these invalid water vapor assumptions. Their handlings of rainfall processes are quite inadequate. 2. They lack an understanding and treatment of the fundamental role of the deep ocean circulation (i.e. 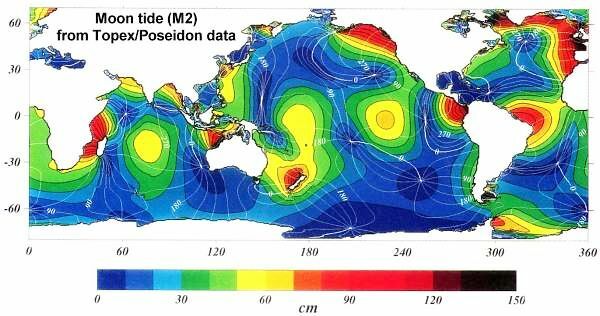 Meridional Overturning Circulation – MOC) and how the changing ocean circulation (driven by salinity variations) can bring about wind, rainfall, and surface temperature changes independent of radiation and greenhouse gas changes. 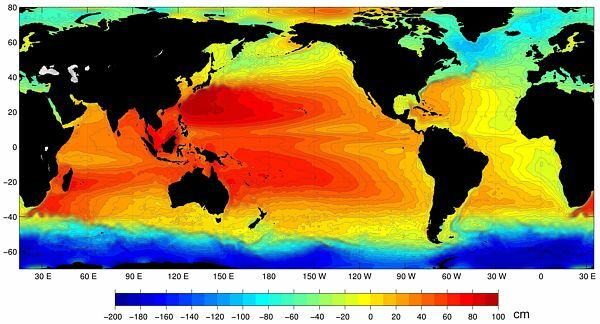 These ocean processes are not properly incorporated in their models. They assume the physics of global warming is entirely a product of radiation changes and radiation feedback processes. They neglect variations in global evaporation which is more related to surface wind speed and ocean minus surface and air temperature differences. These are major deficiencies. Ferenc M. Miskolczi: "..one would think that the strength of the greenhouse effect (GHE) on Earth would be calculated based on atmospheric physics. ... That is, the computer models of the atmosphere would incorporate the physics of how the greenhouse effect works, so that by inputting some measured physical properties, the atmospheric gases, the models would determine the strength of the greenhouse effect and the surface temperatures. Unfortunately, this is not the case... Parameters are just set to obtain the observed temperature. " our knowledge about Earth's climate is still inadequate; too inadequate to base computer models on. our knowledge is changing rapidly. computer models can never predict the future; they are useful for studying the past. computer models cannot be verified, nor proved wrong. They are not scientific. ignore the IPCC and pay attention to actual observations. the whole IPCC report is a house of cards, based on flimsy and concocted evidence. Anthoni, J Floor (2007): Science needs skeptics: The important roles that outsiders and skeptics play in science. Global climate models and their limitations: http://www.heartland.org/publications/NIPCC%20report/PDFs/Chapter%201.pdf. Before the whole world considers spending extraordinary effort to remedy and mitigate the catastrophic problem of CO2, extraordinary proof is required first. Here we'll dissect the various extraordinary claims of the IPCC. Was pre-industrial CO2 lower than today? This graph shows the most important measurements of CO2. The red curve is the Keeling curve of actual CO2 measurements at Mauna Loa, Hawaii. It is paralleled by similar measurements elsewhere, all located by the ocean. Although CO2 concentrations there vary remarkably, a procedure is in place to record minimum values, considered 'the background level'. In recent years, this 'adjustment' has been so perfect that natural variations are no longer visible . Is this fraud? Preceding the Keeling curve, are precise chemical measurements done over a period of 150 years. They too show enormous noise but also a consistent swing (the green curve). This would have been unacceptable to the CAWG theory. Fortunately CO2 bubbles can be found in ice cores like that from the Siple dome (brown). But it refuses to join up with the Keeling curve. So it was shifted by 83 years, because the first 50 metres (4.5 bar) consist of loose firn rather than closed bubbles (is somewhat defensible). The corrected Siple curve spliced onto the Keeling curve gave the IPCC the perfect IPCC hockey stick for carbondioxide. The Siple curve is smooth because the ice core data is not a year by year measurement for each depth. It is measurements of a range of layers, which are not linearly connected. They then construct a CO2 average for each year. This means that each year of data points is not a measurement; it’s a calculation of disjointed averages. Hence any year-over-year specific changes in CO2 (the detail and the variations) will be lost. But many scientists disagree, as expressed by Prof Jaworowsky: indeed CO2 gas dissolves readily in ice under pressure, forming clathrates; drilling contaminates cores with drilling fluid while forming cracks; as ice cores relax, dissolved CO2 gas from clathrates expands and forms new bubbles; gas escapes from ice cores (likewise for nitrogen and oxygen at different 'dissociation' pressures); average pre-industrial CO2 concentration was around 330ppmv, not 260. Another fact is that CO2 is 70 times more soluble in water/ice than nitrogen and 30x more than oxygen. In other words, CO2 disappears from bubbles in ice over a period of up to a millennium, thereby falsely lowering the CO2 readings. It also diffuses through the ice, thereby effectively smoothing natural variations. This is also borne out by CO2 levels in other warm inter-glacial periods. Also archaeological studies of leaf remains show that their breathing pores (stomata) did not adjust to lower CO2 levels. Drake, Jonathan C (2008): MLO (SIO) data changes. http://homepage.ntlworld.com/jdrake/Questioning_Climate/_sgg/m4m1_1.htm. Relative CO2 concentrations can be inferred from sediment cores, some dating back nearly one billion years ago. The graph here was produced by Budyko, already back in 1977 and has been confirmed by many other measurements, although small differences remain. It shows that CO2 in air has always been much higher than today at 2000-4000ppm. In the carboniferous epoch land plants laid it down as coal, doing it again in the Permian. During the Triassic and Jurassic epoch it allowed huge plants and animals to prosper. In other words, carbondioxide is good. CO2 appears to be produced by volcanism, which is now at a low. 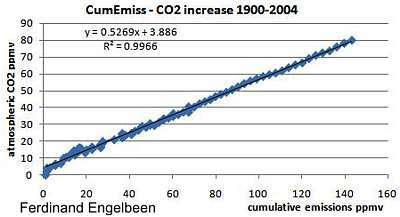 The Keeling curve does not measure average CO2 but minimum CO2. the IPCC bases its claim on a single ice core(but other ice cores also show lower concentrations). there is no proof that the measured low CO2 is indeed real and accurate. during the ice ages CO2 levels were indeed lower but not as low as suggested by air bubbles in ice cores. the world is still recovering from last ice age. carbondioxide is enormously beneficial to life. See chapter 5 Greening Planet. volcanism appears to control CO2 levels in the distant past; ocean temperature in the recent past and human emissions somewhat in the present. Is burning of fossil fuels responsible for the rise in CO2? Many studies point to the fact that CO2 from fossil fuel is now found in plants, ocean and atmosphere, where it didn't occur before the industrial age (fact). So it is a new addition to the carbon budget of the world. At the same time we see CO2 concentrations in air rising steadily, creating a strong correlation between the two (see above). So the overwhelming consensus is that anthropogenic CO2 is indeed the cause of rising carbondioxide levels in the atmosphere, even though conflicts remain and proof eludes. But could there be an other explanation? The Mauna Loa CO2 curve (Keeling curve) is sufficiently known, but this graph shows detailed seasonal fluctuations of this curve, and also from other stations. 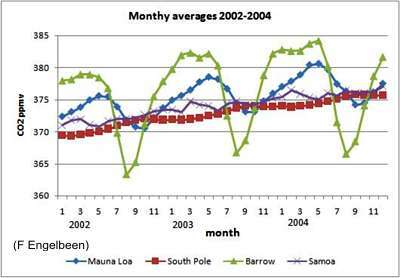 Going from north to south, the fluctuations become less: Barrow Alaska (green), Mauna Loa Hawaii (blue), Samoa near equator (purple), South Pole (red). From this, one can conclude that CO2 is mainly produced in the northern hemisphere (where most people live), where it also disappears (because most land plants live there too). Note that the rise in CO2 is always more gradual than its decrease, which dips in the months 6-8 (June-August), the growing season in the north. It suggests that the northern continents absorb most CO2, whereas the oceans (Mauna Loa, Samoa) do very little. It also suggests that the residence time of CO2 in air is no more than a few months rather than years, because in 4 summer months nearly all of the increase of the whole year, is undone. But isotope analysis suggests 5-14 years, most likely 5 years. The IPCC says several centuries. This beautiful 'carpet' graph from NOAA shows the CO2 fluctuations by latitude and year. It confirms again that most of the CO2 is produced and consumed in the northern hemisphere and that atmospheric mixing (transfer from north to south) does not appear significant within one year. High absorption rates over the continent-rich northern hemisphere suggests that the oceans are not the ones absorbing CO2. CO2 is not entirely equally distributed over the globe as the map shows for concentrations measured at 8000 metres height, at the top of the troposphere, during the northern summer. Note that the scale is exaggerated, like that of the carpet graph above. The variation is only around 15ppm on a maximum of 380ppm. During the northern summer CO2 concentrations are lowest in the northern hemisphere as shown before. Remarkably, the highest concentrations are not found above industrialised areas but in the subtropics bordering the desert zones. Lowest concentrations are found in the polar vortexes (whirling winds), with a deep trough around Antarctica. It is remarkable that for a gas which is heavier than air, its concentration changes little from the surface to the top of the troposphere. Note that the colour scale is deceptive, changing 3 colours for 5ppm at its high end and not changing colour at its low end. There exists a paradox about the residence time of carbondioxide in air. This diagram was taken from the place where the carbon pipe idea was explained (acid2/pipe important reading!). CO2 is returned to air by animals who breathe it out after 'burning' some of their food, but most of the food chain is decomposed by bacteria and fungi who have a difficult job of stripping C,H and O from dead biomatter, returning CO2 in the process. But in the sea most of it is done in several weeks (residence time 1 month, say). We also discovered that plants and bacteria team up in the process of symbiotic decomposition in order to speed the process up and more importantly, to complete it. Thus the stream of carbondioxide to roots is fast, but it never enters the atmosphere. Similarly in the sea between plant plankton and its symbiotic decomposers. Thus CO2 has very short and also long residence times. There is a continual exchange between sea and land, in the form of an imaginary carbon pipe. When an ice age begins, the sea cools and absorbs CO2, which it steals from the land. The land vegetation becomes poorer. In a warm interglacial, the reverse happens and the land vegetation becomes richer. The circulation in this carbon pipe can be quite fast, even though CO2 concentrations do not change notably. But with higher concentrations, plants are more productive and the flow through the pipe is faster. The reason the IPCC scientists estimate a CO2 residence time of centuries, comes from believing that the increased concentration is entirely due to humans and that it is still growing. Having 80 ppm left after say 50 years, with about 3ppm added each year of which 2 ppm remains, means that should we stop burning fossil fuel today, it will still take a couple of centuries before the air is back at pre-industrial 290ppm at a rate of about -1ppm per year. The IPCC treats human CO2 as a separate leaky bucket with a 0.5-1ppm/y hole in it. This bucket is filled to 80ppm and its level is rising with 3ppm/y, and the other bucket has no hole in it and is filled to 290ppm while staying steady. So this is what they told their computer models, but could there be a better explanation? It is clear that land plants have an uncanny ability to remove CO2 from air, and that this ability keeps up with additional amounts of CO2. However, their rate of absorption can increase only if the background level of CO2 increases. In other words, rather than being a leaky reservoir with a residence time, the atmosphere works more like a pipe with a throughput depending on the CO2 concentration (pressure). The higher the pressure, the higher the flow. We coined and explained this idea in ocean acidification/carbon pipe (important read). This idea is also supported by the fact that during ice ages carbon flows from land to sea while during warm interglacials the opposite happens. In other words, the rise in CO2 is only partly from humans, but it does not matter because nature adjusts to more 'food'. The oceans have been expelling CO2 ever since the warm interglacial began. Life as we know it, and civilisation, would otherwise not have been possible. In the past century we saw it rise by 0.6ºC with considerable fluctuations. Just to tie this new understanding together, let's make a prediction (which is falsifiable = can be proved wrong), by way of example. At the moment the sun has ended its most active period that led to a rise in ocean temperature (+0.6ºC). Henry's law says that about 3% gas exchanges per degree C (at present temperature). If only half the ocean takes part (19,000GtC), 0.6 degree warming would expel 360 GtC, or 360/700 x 330= 170ppmv. Human emissions 140 ppm. Thus the sea is an important contributor. The sun has entered a period of low activity and the sea has begun cooling, but will do so more rapidly than warming (2-3 times). Thus soon the sea will be absorbing an amount equal to half of human emissions, leaving the other half for land plants. The Keeling curve will flatten out and even reverse direction, fast, because plants are bigger now and hungrier, trying to compete with the sea. Residual CO2 will diminish as also suddenly IPCC's residence time for CO2 becomes zero or even goes negative! Please note that these figures are rough and an improvement is welcome. Even if the sea absorbs rather than expels CO2 now, this prediction may still come true, as the sea then absorbs more due to cooling. June 2011: indeed the Keeling curve has begun flattening, and also the rise in sea levels. Indeed the ocean's heat content has been declining as measured by the reliable ARGOS drifting autonomous depth buoys, operating since 1995 . In blue the raw Ocean Heat Content (OHC) anomaly (increase/decrease) and in red the averaged ocean temperature. See also Chapter 3 measuring_temperature/ocean_temperature_measurement. Note that a much longer period of observation is needed before conclusions can be drawn. Note also that the surface temperature rather than heat content determines whether the oceans absorb or release CO2, and wind speed is also important. 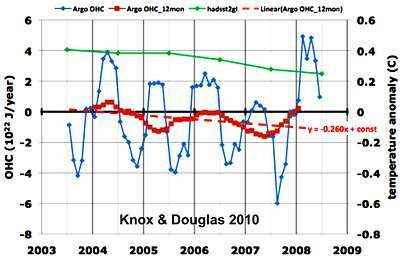 Knox R S & Douglas D H (2010): Recent energy balance of Earth. Int J Geosciences, 2010, vol. 1, no. 3. http://www.pas.rochester.edu/~douglass/papers/KD_InPress_final.pdf. (free). there exists overwhelming (see missing oxygen) consensus that human made CO2 is the cause of rising carbondioxide levels. but the science is not settled. There are too many conflicts. CO2 does not have a long residence time. Most of it recycles very fast (weeks to one year) but some of it lingers in air much longer (several years), called a residual. CO2 has been measured accurately and reliably only since 1960. But there are questions about the method. short cycle times cannot be measured with radioactive isotopes. see further. during an ice age, carbon goes from land to sea and during warm interglacials, from sea to land. 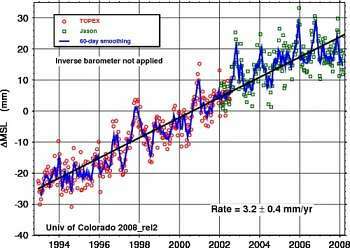 Are atmospheric temperatures increasing and is this unprecedented? This question should be easy to answer, but surprisingly, it is not. We've just seen the drama of the hockey stick and in chapter3 about measuring temperatures we've stumbled over a number of insurmountable problems. So let's go back to the end of last ice age. The temperatue then may have been 20 degrees lower (in Greenland) but for the world more likely, only 8-10 degrees (some say 2-4). In this graph also the hockey stick is shown (in grey/red, top right), which immediately refutes that the 1990s have been the warmest period, and that higher temperatures could be catastrophic. In fact, the world has seen worse temperature swings in the past 5 million years, shown in the graph below, and temperature has been above today's (dotted line) for a long time. This immediately refutes that a rise in temperature would be catastrophic. Note how sea levels first rose by 17mm/year (melting of ice caps), but gradually flattened to 1-2mm/y, which means that the sea is still warming and therefore expelling CO2. At some time soon, this can be expected to end. Climate swings have progressively become worse over 5 million years. The last ice age is on left. Further back in time even warmer climates occurred. 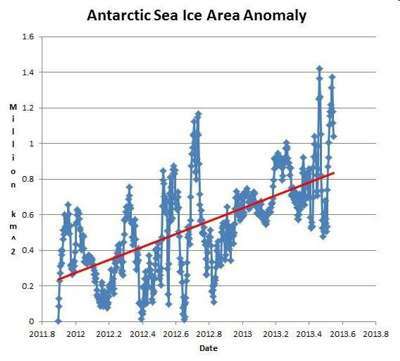 The IPCC hockey stick would not be visible on this scale. The temperature record from land-based thermometers and ships' thermometers is not perfect but it shows a large agreement between them. Both show a steady rise from the beginning of the industrial age, but land temperatures outrun sea temperatures as expected. Alas, land temperatures have been fiddled with, so the downturn after 1998 is not visible. They also suffer from urban heat, which makes the sea temperatures therefore more reliable. 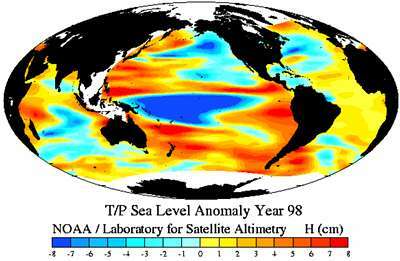 Sea temperatures are more important anyway because of their large size and very large mass. Superimposed on the upward trend is a slow 40-60-year wave of unknown origin, but tracking solar strength, and a ten year cycle is also visible, identified as the Pacific Decadal Oscillation. The sea appears to have warmed by +0.4ºC and the land by some +1 degree. This graph of ocean heat content and surface temperature shows a slightly different picture, although it is based on the same sources . Interesting is how all curves have a very similar trend, meaning that the temperatures of ocean and Earth's surface, are closely linked. It is also interesting to note that the ocean varies in temperature to a depth of 3000m, which means that there is unexpectedly good mixing down to that depth, and that the whole water column to 3000m depth may contribute to either outgassing of CO2 or its absorption. It is strange, however, that rather large swings in ocean heat content did not mirror itself in the two temperature records. It is stranger still that the deepest part of the oceans (green curve) experiences the largest swings (volcanic activity? or the effect of 'reconstruction' with models by Levitus 2001?). Meteorologist Joe D'Aleo: "... leading meteorological institutions in the USA and around the world have so systematically tampered with instrumental temperature data that it cannot be safely said that there has been any significant net 'global warming' in the 20th century." 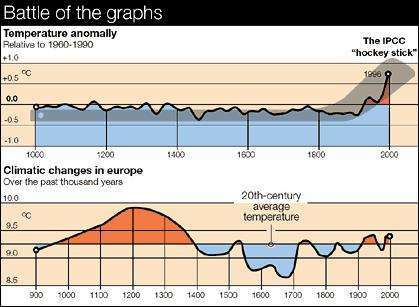 This very interesting graph relates periods of warming and cooling over 4000 years to known historic events. (click for a larger version) It is even uptodate to Nov 2009 after cooling began in 1998. Study it to let the effect of temperature on civilisation, sink in. In every warm period, civilisations flourished, only to languish or disappear in successive cold periods when there was not enough food. The most recent cold period was the Great Potato Famine (Dalton mimimum, 1845-1852) and before that the Little Ice Age when the Thames froze over (Maunder minimum 1645-1715), which caused hunger, disease and mass emigrations to the USA. forget the land temperature data: both air and land store very little heat. Look only at the ocean data. oceans contribute to a depth of over 3000 metres. Not so sure. the recent history of instrumental temperature is still questionable, particularly the land part. it is not certain that recent temperatures have been rising. Most of it is caused by urbanisation and fiddling or 'adjustments' as they are called. warming as claimed by the IPCC is not unprecedented. 1998 was not the warmest in this millennium. warming by 2 degrees has happened before without catastrophic effects. warming is good; cooling is bad. the IPCC claim is wrong. Is warming caused by fossil fuel burning? The whole panic about CO2 is based on the fear that increasing levels of 'greenhouse gases' may cause runaway global warming as 'happened' on our 'sister planet' Venus. But Venus is a strange planet, producing more heat than it receives. Still, the IPCC bases its computer models almost entirely on the assumption that CO2 causes warming. Yet a vast amount of evidence proves that this cannot be the case. All ancient records, from ice cores to sediment cores, to corals to dripstones, show that temperature changes preceded CO2 changes by 100-800 years. But even the most recent records show this. Here are the fluctuations in temperature and CO2 (from Mauna Loa) from 1958, also showing that temperature mainly leads CO2. This overwhelming fact means that CO2 does not cause temperature changes. The diagram shows how one can conclusively plot whether a consistent time lag exists between two signals. On left an imaginary plot of temperature (red) leading CO2 (green) as the time scale runs from right to left. Both are perfect oscillations with a 90 degree phase shift, such that when one is plotted against the other (in an X-Y plot), a perfect circle is run in the clockwise direction. So clockwise means the bottom axis (red) is in the lead, and counterclockwise means the opposite. Jeffrey Glassman [2,3] has taken the detailed data from the Vostok core and plotted each [temperature, CO2] pair on an X-Y plot, leaving them interconnected. The result is a squiggle with a consistent clockwise rotation, proving that temperature (bottom axis) is always in the lead. He did something more amazing, by fitting the complement of solubility, the part in air that is in equilibrium with water (green curve), which gives an even better fit than a polynomial. This provides very strong evidence that the outgassing of the sea is the main cause of CO2 in air (it could also mean solubility in the ice of ice cores). What's more, this curve fits better than a polynomial fit through all data points. The green line shows a residual CO2 in air of about 100/15= 6ppmv/ºC, as it cannot show how much CO2 flows from ocean to land and back. We'll come back to this later. The outgassing-from-oceans relationship is also supported by Endersbee, giving a straight line correlation (link). Endersbee's line arrives at a residual of 150ppm/ºC over a short period of 20 years. Ole Humlum et al. looked at the recent phase relationship between CO2 and temperature, concluding that "changes in CO2 always lagging changes in temperature".This means that temperature changes cause CO2 changes and not the other way around. 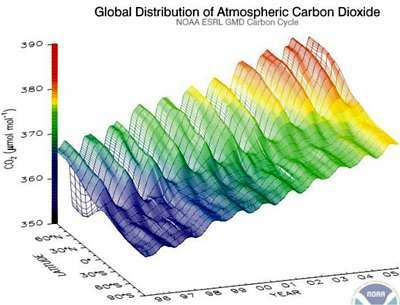 Humlum, O et al (2012): The phase relation between atmospheric carbon dioxide and global temperature. Sciencedirect link. Venus is a young planet with a hot surface and very dense atmosphere. It is not our "sister planet". There has never been a runaway greenhouse effect. It radiates more heat than it receives.Chapter1. wherever CO2 and temperature were measured, in ice cores and sediment cores, corals and dripstones, and even in air, temperature changes always preceded CO2 changes. This means that warming causes CO2 to rise, and not the other way around. Glassman established a strong correlation between ocean's outgassing and residual CO2. Earth has been through periods with much higher CO2 concentrations (up to 4000ppm) and this was only beneficial. Budyko. there have been epochs with high CO2 concentrations but low temperatures. CO2 is such a potent greenhouse gas that its effect is fully saturated. Chapter1. there exists no experimental proof that CO2 causes warming. the assumptions of the IPCC have no basis. Its report is just a house of cards (very fragile). Are sea levels rising? Coming out of the last ice age, sea levels have indeed been rising at 17mm per year for six millennia, but for nearly 1 millennium, sea levels rose more slowly at 1-2mm/year. This graph shows that 2-3 centuries ago in the Little Ice Age, the rise halted, only to continue at a steady 1.7mm/y since 1850, the industrial age. Very recent measurements with TOPEX and JASON satellites, show that a rise of 3.2mm/y (righthand graph =the top of left-hand graph) has flattened out and begun to decline. Because continents rise and sink while bobbing on the underlying 'liquid' mantle, measuring sea levels was always a dodgy affair. Today with very precise satellite altimetry, the level of the sea can be determined with such accuracy that even anomalies can be observed. This world map shows where the highs and lows are, but they cannot yet be explained. The two hemispheres also behave differently. Normally one expects high barometric pressure to cause a lower sea level.Note that data is missing for the polar areas because Topex/Poseidon orbits SW to NE rather than S-N. See also Chapter 7. The sea level story is a bit more complicated as shown in the actual sea topography with its hills and valleys. The balancing point is zero (yellow) on this scale and what immediately strikes is the deep and large trough of up to two metres deep around Antarctica, caused by very strong westerly winds which due to Ekman spiral, move water away from Antarctica towards the equator. The balancing bulge (red) goes only to one metre high and is more widely distributed. Thus depending on wind strength around the poles, more or less water is pushed towards the western sides of ocean basins while water is borrowed from the eastern sides of these basins and from the poles. 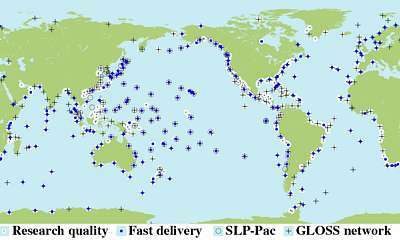 A network of sea level measuring stations is scattered along many coasts and oceans and maintained by the University of Hawaii. It so happens that very few operate in the poles and many of these are not working. Thus the majority of stations is located in the bulge of the seas. When it is reported that 90% of stations see a sea level rise, this is true but does not mean that the whole of the ocean is rising, as the sinking trough around the poles is not adequately represented. The COADS database (NASA)  documents how wind speed has been changing by up to 30% over one century and that it has in the past 40 years been climbing again and very recently (since 2000) been dipping. Thus where sea levels were previously rising, they will now begin to dip and vise versa where they were dipping, will now rise and the whole network of stations will dip . it appears that seas have stopped rising for a while, since 1998. Schwarz, Stephen E (2007): Heat capacity, time constant and sensitivity of Earth's climate system. J Geophys Research. http://www.ecd.bnl.gov/steve/pubs/HeatCapacity.pdf. difficult but important climate science. Fletcher J O (2000): Normal Climate change. What is normal? On this web site. A must-read! Much ado has been made of the melting of polar ice caps but remember that these always melt in summer, to recover in winter again. Scientists and scare mongers mainly looked at sea ice extent, which, because it is sandwiched between major habitats ( water and air), is not a reliable measure. It would be better to look at sea ice thickness instead. 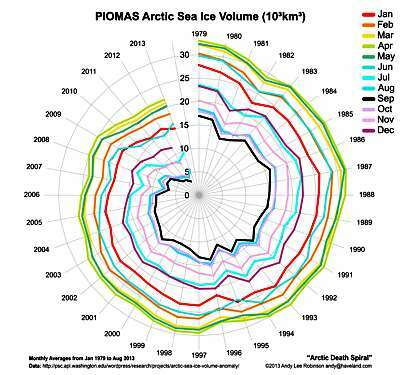 But the spiral diagram named "Arctic sea ice volume death spiral" (courtesy of Andy Lee Robinson) shows considerable permanent loss of sea ice. The coloured curves plot ice volume for each month, beginning in 1979 and ending in 2013, based on a computer model extending actual measurements. The volume scale runs from 0 to 30,000km3(cubic km). Understandably, there is more ice in the coldest winter months Jan-Apr. Seasonal loss of ice is nearly half (50%) and monthly variation up to 10,000km3 (10-30%), most variation occurs in the warm summer months Aug-Oct.. But notice the slight up-tick in 2013.The simple graph underneath shows sea ice extent rather than volume, agreeing with the spiral. But notice an apparent "standstill" since 2008, similar to the nineties. Contrary to the Arctic, Antarctica enjoyed solid growth in recent years, consistent with recent global cooling. Notice the large seasonal variation and that the total area is very large (19.4 million km2). Sea ice extent is a poor indicator of global temperature. It depends more on currents (+winds) and precipitation (snow) rather than temperature. The polar regions are not representative of global climate (little moisture, excessively low temperatures,small area, dark winter, high albedo). There is a large difference between north and south, still unexplained. Although the Arctic shrank, Antarctica expanded with an amount of ice dwarfing the northern sea ice. The Arctic shrank fastest in the early 2000s but no longer. Both ice caps appear to be growing again. In this subchapter we'll discuss a number of topics which do not directly alter what was discussed before. It is a kind of rats-and-mice (various items) section, but some of them are potential indicators of the human cause. The isotope carbon-13 was discussed in chapter3 with this diagram. Carbon-13 is a stable carbon isotope which occurs at 1.1% in the atmosphere, which calibrates to a 'delta' of -7‰ compared to the C-13 standard. But fossil fuels mysteriously contain less, by as much as -50‰ (-5%). Thus when fossil fuels are burnt, and their carbon mixes into the biosphere, the atmosphere ends up containing less Carbon-13. Society also makes cement from fossil carbonates, but these add (+1‰) to the atmosphere (-7‰). However, for a first estimate we can ignore this. The diagram here shows that the air becomes indeed deficient in carbon-13. Note that the black curve shows annual emissions, whereas the red curve (Keeling 2005) shows what is missing from air and is thus cumulative. Note also that the red C-13 scale is upside down. This trend has been measured at many sites, all roughly agreeing with one another. Missing from the red curve is seasonal variation  which is a steady 0.4‰ or the whole size of the red curve! From 1980 to 2000 about 0.4‰ went missing compared to a -7.8‰ baseline or about 5% of the available C-13. During that period fossil fuel emissions amounted to about 120GtC with a deficiency in C-13 of -50‰. If all that carbon had remained in air, it would have contributed to 120 / 700 x 50 = -8.6‰ loss rather than -0.4‰. Another way of looking at it: 8‰ corresponds to 700GtC, and 0.4‰ or 35GtC 'missing'. To replace this by carbon which is 6 times more deficient requires 1/6 of 5/6, or 7GtC of fossil fuel or one year's burning. Very little indeed. But these calculations are rather coarse, and some fossil carbon comes from coal which was laid down by plants, and which is thus less 'deficient', making the 7GtC more. The most important point to draw is that fossil fuel carbon has disappeared almost completely, and this is no surprise because plants prefer 'classic' carbon-12. most of it is recycled into the biosphere. As expected. To convert from GtC to ppmv, divide by 2.13 or multiply by 0.471. Thus 700GtC = 329 ppmv. To convert from ppmv to GtC, multiply by 2.13. Photosynthesis CO2 + H2O => CH2O + O2 makes 10% more oxygen than CO2 used because the formula is an approximation. Likewise, decomposition needs 10% more oxygen. Conversion factor O2/CO2 = 1.1. Combustion requires 45% more oxygen than the CO2 it produces, due to H combustion. Conversion factor O2/CO2 = 1.45. See fossil fuel properties above. CO2 data from CDIAC http://cdiac.ornl.gov/trends/co2/contents.htm including C-13 and C-14 for many stations. In AR4, the IPCC shows this graph with the Keeling curve from 1970 and the missing oxygen curve from Bender (2005) [1,2] (Bender curve?). It clearly shows that the rising CO2 concentration was caused by the burning of fossil fuel because this 'new' fuel required 'new' oxygen in order to be burnt, and apparently in the same quantities. 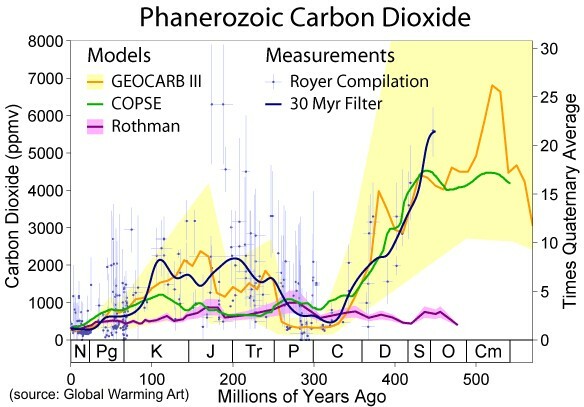 However, the graph was intentionally misleading because the vertical scale for oxygen (magenta) is very different from that of carbondioxide (black). In chemistry, volumes of gases can be compared because a certain volume containing oxygen, has the same number of molecules as the same volume of any other gas (pressure and temperature must be the same of course). Thus numbers expressed in ppm-by-volume or ppmv, can be compared chemically with one another. However, the per meg unit needs to be divided by 4.8 to give ppmv oxygen because oxygen is 20.95% in air, and (N2+O2)/O2=100/20.95=4.77. Assume that the natural world is in balance, each year consuming and producing oxygen and carbondioxide in equal quantities, then the residual CO2 over a decade would be zero. Now humans are disturbing this balance by burning fossil fuel and requiring more oxygen than they return, resulting in a gradual increase in CO2 for a corresponding loss in oxygen, about 41ppmv O2 per decade. One cannot have lost oxygen without also having found CO2. plants making more biomass because that returns oxygen. plankton making more biomass because that returns oxygen. the only conclusion remaining is that the sea absorbed it because the concentration in air was supposedly higher than the average concentration in the sea (pCO2aq). but this has been going on for at least 60 years at a very steady rate. as if the sea has either been cooling or remaining at a constant temperature or still too cold to expel CO2. Assume that we didn't know how much we have been burning (we really don't know how much burning goes on), then the residual CO2 of 17ppmv demands that it was obtained by burning the corresponding amount of 1.45x17= 25ppmv O2. However, we are missing 41ppmv oxygen. In other words, we are missing a residual 16ppmv O2. Where could that have gone? excludes unaccounted burning for the same reason. excludes fossil fuel burning for the same reason. excludes dissolution in the sea because oxygen is 30 times less 'willing' to dissolve than CO2. but plankton can absorb oxygen while returning CO2 to the sea without it leaving the sea. Because dead plankton sinks to the sea bottom, it takes hydrocarbons (body mass) with it, made from both oxygen (animals) and CO2 (plants).This process is often referred to as "the carbon pump". Its magnitude varies from place to place and is unknown. oxidation of other compounds like iron to rust, rock, etc. Not likely significant. oxidation of CO2 to CO3 by corals and the deep sea. Unknown. This thinking leads to a dead end. The bottom line is that the missing CO2 is most likely absorbed by the sea. It is important to realise that if the sea was otherwise an expeller of CO2, the small amount of human CO2 in air has effectively stopped it from doing so. And in case the world begins to cool, the seas will absorb more and more CO2, possibly even causing the rising Keeling curve to flatten and descend. Time will tell. the experiment or a conversion factor could be wrong. Not likely but we remain skeptic. seas must be absorbing CO2 rather than expelling it. seas must be absorbing CO2 at a constant rate. this must have been going on for at least 60 years. the missing O2 suggests that humans are responsible for the rising residual CO2 level in air. if residual CO2 doubled to 800ppm, oxygen would diminish by -1200ppm from 20.95 to 20.83% which is unnoticeable. when seas cool further, the residual CO2 is bound to diminish. there exists little uncertainty about all this. This chapter was changed according to suggestions from Ferdinand Engelbeen, July 2011. Battle M et al. (2000): Global carbon sinks and their variability inferred from atmospheric and d-13C. Science, 287, 2467-2470.
 the per meg delta value is not exactly the same as ppmv as it is based on the ratio of oxygen to nitrogen (21/78)=27% whereas oxygen ppmv is 210,000 (21%). The delta is calculated as in delta-O-13: deltaO2/N2 = ((O2/N2sample - O2/N2standard) / O2/N2standard) x 1E6, (in moles) which is 30% higher than delta expressed as ppmv. Bender quotes a conversion factor of 4.8 from ppmv to per meg delta(O2/N2), which is close enough. for O2:CO2 ratios of fossil fuel burning see table at the beginning of this chapter. Because fossil fuel has been underground for a very long time (millions of years), its radioactive carbon component with a half-life of about 5000 years, has been extinguished. Thus CO2 from fossil fuel has no radioactive carbon left, which causes it to dilute the radioactive carbon in air and biosphere. This is also called the Seuss effect. (Hans Eduard Suess 1909-1993 was an Austrian physical chemist and nuclear physicist). During a short period of 7 years, the dilution of the radioactive isotope carbon-14 was measured at the north (Pt Barrow) and south poles , resulting in two straight trends with opposite seasonal fluctuations. Carbon-14 decline was measured in carbondioxide, so it gives us another idea of how much fossil carbon dioxide remains in air. The graph shows a 100‰ (10%) decline in one decade. Carbon-14 occurs at the low concentration of 1 part per trillion (0.0000000001%) of the carbon in the atmosphere (0.001ppm), but this is irrelevant. If its concentration became 10% less, this corresponds to a dilution from fossil fuel of 700 / 10 = 70Gt or 70 / 2.13 = 33ppmv in one decade, which is 55% if emissions during that decade were about 60ppmv. radioactive carbon is made constantly by neutron bombardment of nitrogen N2, at an altitude of 8-15km. It also reacts with oxygen to form radioactive CO2, which is easily washed out of the atmosphere by water. It then takes part in the carbon cycle. the production of C-14 depends mainly on solar activity and cosmic radiation. it also depends on volcanic and seismic activity (CO2 from volcanoes has no C-14). the C-14 measurements are compared to a standard oxalic acid from 1955.
thus radiation changes since 1955 and in the period 1984-1992 must also be taken into account. plants prefer classic CO2 over the 'heavier' radioactive CO2. classic CO2 'evaporates' more readily than radioactive CO2. Thus the oceans exhale low-C-14 carbondioxide, almost indistinguishable from fossil fuel CO2. the dilution of carbon-14 agrees strongly with the idea that the rise in CO2 concentration in air is proportional to human emissions, suggesting that it is caused by human emissions. the origin of the diluting CO2 cannot be ascertained because the ocean's outgassing is also poor in radioactive carbon. for inexplicable reasons the measurements were discontinued and the Suess effect is no longer current with global warming advocates. The caption to these five graphs from IPCC AR4 reads: "Global trends in major long-lived greenhouse gases through the year 2002. These five gases account for about 97% of the direct climate forcing by long-lived greenhouse gas increases since 1750. The remaining 3% is contributed by an assortment of 10 minor halogen gases, mainly HCFC-22, CFC113 and CCl4." As has been shown before, both carbondioxide and methane trap infrared radiation so eagerly that their effects saturate at a mere few metres in air, thus becoming part of convection with no distinction from oxygen and nitrogen. Note that methane emissions have been levelling off, and it is not known why. Fugitive releases escape during the production of gas, shale gas and coal, and surprisingly, coal has least of these . Methane is natural gas CH4 which burns cleanly to carbon dioxide and water. Methane is eagerly sought after as fuel for electric power plants because of its ease of transport and because it produces the least carbondioxide for the most power. Also cars can be powered with compressed natural gas (CNG) for short distances. In many countries CNG has been widely distributed as the main home heating fuel. As a consequence, methane has leaked to the atmosphere in large quantities, now firmly controlled. Grazing animals also produce methane in their complicated stomachs and methane escapes from rice padies and peat bogs like the Siberian permafrost. Even if the IPCC radiative greenhouse theory were true, methane occurs only in minute quantities in air, 1.8ppm versus CO2 of 390ppm. By weight, CH4 is only 5.24Gt versus CO2 3140Gt (on this assumption). If it truly were twenty times more potent, it would amount to an equivalent of 105Gt CO2 or one thirtieth that of CO2. A doubling in methane would thus have no noticeable effect on world temperature. However, the factor of 20 is entirely misleading because absorption is proportional to the number of molecules (=volume), so the factor of 7 (7.3) is correct and 20 is wrong. With this in mind, the perceived threat from methane becomes even less. The fact that methane in air has been levelling off in the past two decades, even though we do not know why, implies that it plays absolutely no role as a greenhouse gas. methane occurs in very small concentrations compared to CO2, 600 times less. the IPCC radiative warming factor of methane is 7 rather than the oft quoted 20.
methane concentrations have stopped growing. even if methane concentrations kept growing, its effect would still remain unnoticeable. it is ludicrous to worry about methane. Flood, Wilson (2011): The methane misconceptions. Energy&environment 22-3. Free PDF. Clemente, Frank (2011): A Test of Prudence Favors Coal -- Part Two. link. The CAGW fear mongers regurgitate ad-nauseam that global warming causes more and more violent storms, because such storms thrive on atmospheric moisture and temperature. But facts show otherwise and it is not known why. 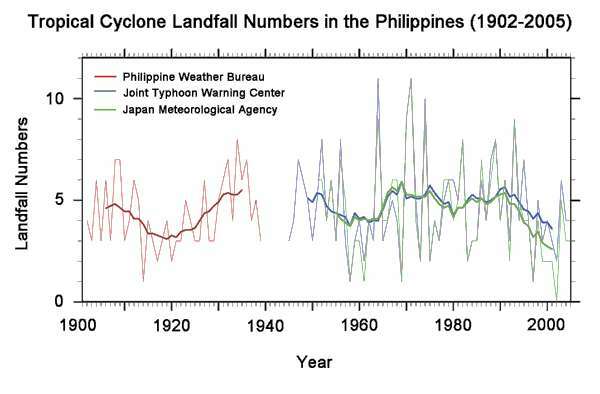 After the disastrous typhoon Haiyan hitting the Phillipines in Nov 2013, the above graph was published, showing that typhoon activity decreased in the recent 50 years. Reports mention a 5m tall storm surge (see oceanography/storms) arriving like a tsunami (see oceanography/special_waves). population: there are not only more people on Earth, with their infrastructures of villages and cities, but more and more people are forced to inhabit risky low areas close to the coast. Others do so by choice. welfare: A long period of prosperity after World War Two allowed people to amass more, and more valuable belongings. chance: Major storms happen by chance and they generate other chance effects like storm surges and trapped waves. Wind strength is also very erratic. rain: Hurricanes bring three kinds of damage: winds+waves+rains. When a typhoon decreases strength over land where no moisture is added, it loses its moisture as heavy rainfall, causing flooding with its related damage. Occasionally flash floods occur, when a typhoon chases its own river flow down-stream. periods of calm: long periods of calm can trick people and catch them unprepared. Building codes may become lax. In coastal areas with hardly any tides, the coast was never shaped to resist waves and tides, such that an occasional tsunami can run far inland, destroying vast low-lying coastal areas.The map below shows where large and small tides occur, the Philippines and Japan both vulnerable. It is unlikely that tsunamis and storm surges can cause much damage in the red-coloured coasts, unless miraculously occurring on a spring high tide which was the case in the Netherlands, 1953. "The mitigation measures suggested for climate change (reduced use of carbon-based fuels, more renewable energy sources, carbon capture and storage, less use of nitrogen-based fertilizers) are all part of a portfolio of approaches that are needed to produce a more sustainable world." This statement reveals the true political motivation in the IPCC. The global warming scare is intended to jolt the world into action for a more sustainable world using less carbon-based fuels and other things. A noble goal achieved through lies, but more to the point: 1) renewable energy sources like wind mills, have proved to produce more rather than less CO2; 2) carbon capture and storage are technological nightmares that do not deliver on energy efficiency; 3) less use of nitrogen-based fertilisers is possible by having more carbondioxide in air. "It is simple physics that these extra gas concentrations will trap an increased amount of outgoing solar radiation reflected off the Earth’s surface, of the order of 1.5 watts per square metre of the Earth’s surface." The physics is far from simple as explained in the preceding chapters. The 1.5 W/m2 heat retention by greenhouse gases is purely a guess, unsubstantiated by fact or by observation. The truth is that so-called greenhouse gases can not, have not and will not have any measurable effect on temperature - ever. "It is also clear that the oceans absorb about 85% of the excess heat resulting from this radiative forcing by greenhouse gases (as well as about 40% of the carbon dioxide). Detailed measurements of the changes in oceanic heat content, and the temperature rise that accompanies this, agree quantitatively with the predicted radiative forcing." Oceans do NOT absorb heat from the air, but warm up due to solar irradiation (by day) that can reach 100m deep. Whether oceans exhale or inhale CO2 is uncertain. Radiative forcing is a failed concept and the models based on it are equally unscientific. "The amount of extra carbon accumulated in the ocean and the atmosphere matches the known quantity emitted by the combustion of fossil fuels." They don't. Huge discrepancies and paradoxes remain. "It is a plain fact that human activities have significantly increased the concentrations of greenhouse active gases in the atmosphere, particularly since the mid-20th century." Incorrect. It is true that humans have added greenhouse gases to the atmosphere, but most of this has been absorbed by plant life. There has been a rise in atmospheric carbondioxide since 1960 but where it came from, is unknown. There is no solid proof that the oceans absorbed the excess carbon. There is no proof whether oceans are outgassing or absorbing CO2. During this time the sun has been active, but since 2000 is entering a state of reduced activity.